I would imagine that there are quite a few applications released by Apple on a daily basis for the iPhone. But when one application is released that is so much better when compared to one of the default applications on the iPhone then it is sure to get a five star review. This application is titled appropriately as Awesome Notes. It is developed by Bridworks. You must have always known that the Notes application on the iPhone is quite limited and this application is the perfect and most worthy replacement or solution for it. 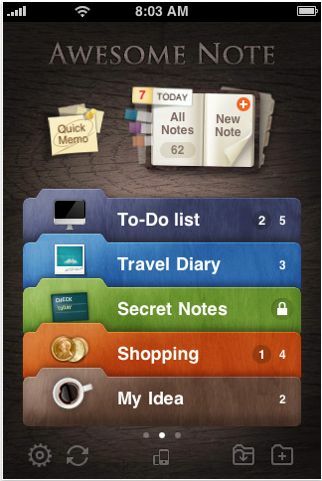 This awesome note application for ipod touch or iphone has been designed quite beautifully and is easy to use. The biggest difference is that with this application, you can organize all our notes into folders. Some people feel that there are too many features, but surely this cannot be called a problem. You can actually start using this awesome note iphone application as soon as you get it. There are some folders & sample content already set up. You just need to customize the titles and add some of your own. Now, you are good to go. 1. Customizable folders as well as pages alongwith unique icons and folders. 2. You can even transfer and backup documents to Google Docs. 3. There is password protection too for your folders. 4. There are also three views from among which you can choose. Thumbnail, list and landscape. The quick memo feature is what makes this Awesome note iTouch application stand out among other note taking applications. This feature can be used to jot notes outside folders or existing pages which you can save later into folders. This version of quick notes is much better than the default version and is among many reasons why you should definitely buy this application for your iPhone. Get this Note iPhone App for Free Here.